In the New York Police Department’s continuing crackdown on costumed characters in Times Square, cops yesterday collared a woman dressed as Sesame Street’s Elmo for allegedly aggressively demanding tips after posing for tourist photos. Rosa Sanchez, 36, was nabbed during an undercover sting conducted by cops. 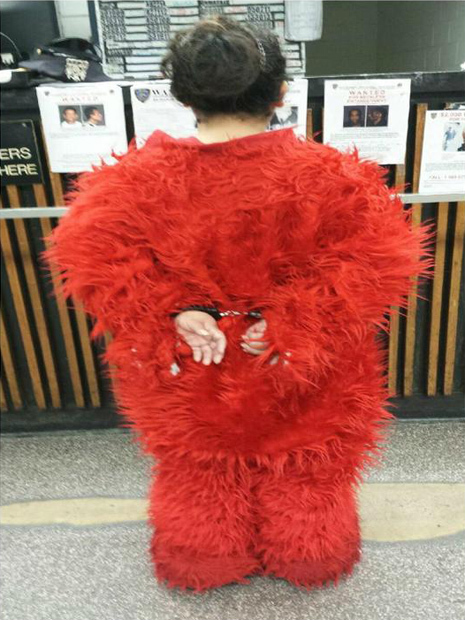 As seen above, she was wearing her fuzzy red outfit (sans Elmo’s head) when she was handcuffed and taken to Manhattan’s Midtown South precinct, where she was booked for aggressive solicitation, a misdemeanor. Previously, a costumed Elmo was arrested after going on an anti-Semitic tirade in Central Park. The cuddly character has also been linked, as it were, to a methamphetamine distribution ring and an Illinois burglar.